Our team has been hard at work to make sure we deliver the best user experience, integrations, and CMS implementation experiences for our clients. We partner with brands seeking the full impact of a powerful digital presence, thus making their vision a reality. 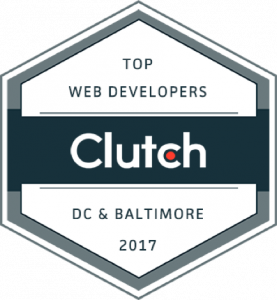 We’ve always known we create great products, which is why WDG is thrilled to announce we have been ranked as one of the top three web development agencies in Washington DC and Baltimore in a new report by Clutch. Clutch is a rating and reviews platform connecting businesses with agencies and developers that best fit their business challenges and needs. To determine the top companies featured in this report, Clutch utilized a unique research methodology. More specifically, they evaluated companies on a variety of factors, including their market presence, ability to deliver their services and, most importantly, their client reference reviews. We want to thank our clients for sharing such candid feedback in their reference interviews. Many of our most recent reviews focus on digital projects. Feel free to read WDG’s client reviews or visit WDG’s portfolio page.